You surely already know that owning a recreational vehicle offers freedom and mobility, allowing you to explore with ease. However did you know that an RV can also provide you with passive income? That’s right, you don’t have to just leave your vehicle parked in the driveway in between adventures. Instead, you can rent it out to others looking to experience RV life for themselves. In turn you could help pay off your RV loan or just earn extra income. Does it cost money to list? In the case of Outdoorsy, RVShare, and other RV rental sites, listing your vehicle for rental is free. However, these platforms will charge a transaction fee when you successfully book a rental. You can think of this as a “finder’s fee” and compare it to similar fees you might pay for renting a room on Airbnb or driving for Uber. These fees can be as low as 15% and go up to 25% of the total rental price. While the actual logistics of listing your recreational vehicle can vary depending on the platform, there are a few basics to consider. At the top of the list, you’ll want to include photos of your vehicles that will entice renters. This can include an overview photo of the vehicle’s exterior as well as interior photos showing off some of the RV’s best features. On the technical side, you’ll also want to pay attention to the recommendations and required photo dimensions for each site and ensure that you’re complying with their listing requirements. Something else to think about when creating your listing is what your RV rules will be. Is your vehicle pet-friendly? Are renters allowed to smoke inside? These are the types of questions you’ll want to answer upfront so that potential renters know if your listing is right for them — as well as potentially save you the trouble of having to clean up pet dander or clear smoke smell you weren’t expecting. What types of vehicles are the most likely to be rented? 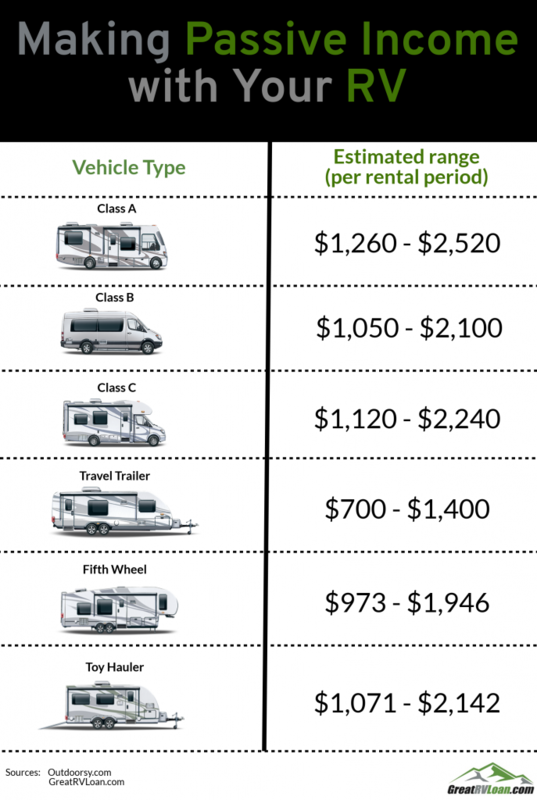 How much can I make from renting my RV? Once again, it’s hard to say how much you can expect to make by renting your vehicle as there are several factors that will come into play. That said, Outdoorsy does offer a tool where you can enter more specifics on your vehicle and see a rough estimate of what a single rental might yield. For example, the site says that a Class A vehicle could earn between $1,200 and $2,500 for a single rental period. Another simple way to get a better idea of what to expect is to search rental platforms for vehicles similar to yours and in comparable areas. This includes looking not only at per night rental fees but also any per week or per month listing rates. Keep in mind that these prices are before any transaction fees you’ll incur so be sure to factor that in when calculating your potential rental income. Easily the biggest concerns that comes with renting your RV is the thought of letting strangers behind the wheel of your property. Luckily one of the benefits of utilizing a rental platform is that they’ll help vett your renters by performing driving history checks. Additionally, in the case of Outdoorsy, the vehicle owners have final say in approving prospective renters. The next major concern is that damage done to your RV while it’s being rented could mean a loss of personal funds. That’s why it’s good to know that Outdoorsy offers a $1 million liability insurance policy on your rental vehicle that covers both the owner and the renter while RVShare offers third party liability, comprehensive, and collision coverage on eligible vehicles. However, to be clear, this policy will not cover you when you’re using the vehicle for yourself and only kicks in during the rental period. If you’ve ever taken an Uber or stayed at an Airbnb, you know how important cleanliness can be when it comes to making a good impression. It’s really no different with RV rentals. After all, your renters will be treating the vehicle as their home away from home during their trip. Be sure to consider this as you prep your RV for rental. Similarly, it’s important to go through a safety and preparedness checklist before renting your vehicle — the same way you would before going on a trip of your own. This includes checking tires, fluids, lights, signals, and anything else that could affect your renter’s travels. Just in case you forget anything, Outdoorsy does have a Pre-Arrival Checklist you can review to ensure your renters have a good experience. RVShare, Outdoorsy and other platforms are commonly referred to as “peer to peer.” This simply means that, instead of maintaining a lot full of rental vehicles (like U-Haul or other such companies might), these services connect two parties: the renter and the owner. Because of this, you’ll need to arrange the key exchange with your renter. When meeting your renter, there’s typically some paperwork you’ll both need to sign before they’re on the way. You should also do a walkthrough with them and demonstrate anything they need to know. On top of that, it’s a smart idea to have some written instructions available for them that will help answer any questions they may have during their rental. This mini-manual can include basic safety and how-to info to a review of the various features and “amenities” to be found on your vehicle. At the end of the rental, you’ll want to do another walkthrough to make sure everything is in order. After completing that, your platform of choice may also mandate that you fill out a return form, which will need to be filed before your renter can receive their deposit back. After that, congratulations — you’ve just completed your first RV rental! If you find success in renting out your main recreational vehicle when not using it personally, you may even consider investing in additional vehicles for the intent of renting them out as well. That’s actually exactly what Jody Rath did, as he explained in a blog post titled “How I Accidentally Created My RV Rental Business.” In that post, Rath recalls how he went from listing his 2015 Winnebago Travato to now having four vehicles he rents on a regular basis. Obviously this approach comes with a number of risks and logistics to consider. Moreover, while the income itself may be passive, managing a fleet of vehicles will likely take some significant work on your park. That said it is one option to keep in mind if you’re looking to add more RVs to your personal collection or want to create your own rental business. Whether you’re looking to make some extra money or want to help pay down your RV loan even sooner, renting your vehicle out on platforms such as Outdoorsy can be a great way to generate passive income. While it may take some work on your part to set up your initial listing, many of these services will help do the “heavy lifting” of getting your listing out there, handling insurance, and more. So rather than let your recreational vehicle sit idle in between your travels, consider letting someone else take it on a journey and put some extra cash in your pocket.